Running late into the night, the Student Government Board meeting that preceded this year’s election nearly overshadowed the results’ unveiling. Following a mostly open-floor meeting in which Pitt’s SGB allowed students to publicly respond to controversial conservative speaker Milo Yiannopoulos’ Monday night lecture, SGB elections chair Celia Millard announced next year’s Board members and SGB president. Natalie Dall, trumping her sole opponent Matthew Sykes, will serve as the president of SGB following this academic year, starting at the end of April. The eight candidates who ran for the eight board seats all won their spots, and junior Sydney Harper won the executive vice presidency, receiving the second highest number of votes in the election. Also up for vote was a referendum proposing SGB constitution changes. Amendments included adjusting the GPA requirements, grammar and instances of gendered language, such as “he/she” and “his/her,” to gender-neutral language using a singular “they” pronoun. The referendum passed with 93 percent voting in affirmation. 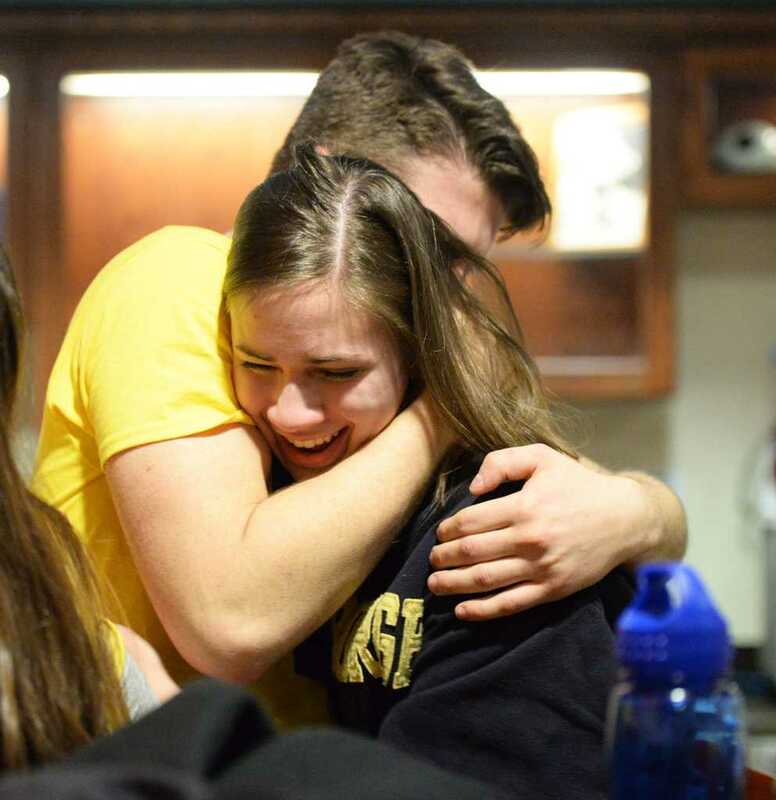 Dall won 65 percent of the vote, with 1,714 students choosing her over Sykes. A total of 2,665 students voted in this year’s election, a severe drop from 2014’s election. In 2014, a total of 4,127 students voted for an SGB member or president. In 2013, 2,520 students voted. For Dall, the meeting that preceded her election will follow her through her presidency. About 125 students — more students than had attended any other SGB meeting this year — lined up to share their opinions and stories about how Yiannopoulos’ talk had offended, hurt and brought them to tears. Board members, including president-elect Dall, teared up as students shared their pasts of racial profiling, exclusion and sexual assault — all experiences Yiannopoulos underwrote at his talk. Reflecting on her campaign platform — which included creating a cohesive sexual assault manual and increasing diversity and inclusion on campus — Dall said she was confident she was heading in the right direction. Hearing students felt underrepresented on campus, Dall said, made her double down on what she knew was a good fight. Harper, a junior and former Pitt News multimedia editor, received the second highest number of votes and highest among Board candidates, making her the executive vice president with 1,461 votes. Board candidate Justin Horowitz received 1,318 votes, Arlind Karpuzi received 1,212 votes, Max Kneis received 882 votes, Samantha Jankowitz received 848 votes, Joseph Kannarkat received 712 votes, Alyssa Laguerta received 386 votes and Rohit Anand received 275 votes. Sykes’ eyes filled with tears after the results were announced, disappointed to learn his time on the Board would come to an end. Sykes, though, said he still plans to help Dall with initiatives they’ve been working on the past three semesters. For most of the board candidates, the election was about going out to campaign and talking to students. “Just being on the campaign trail and talking to students shows we care,” Kannarkat, a sophomore neuroscience and mathematics-economics major, said. Kneis, a sophomore finance and accounting with economics major, also said the campaign was about canvassing and connecting with students. “We got to really see the issues students care about and what Pitt can be,” Kneis said. Karpuzi, a sophomore finance and economics major, said his campaign was about learning what student organizations wanted from SGB. “We went to student organizations to listen and took pages of notes on what they wanted,” Karpuzi said. Newly-elected executive vice president Harper said her involvement with many organizations on campus helps her to see what these organizations can accomplish for students. “With everyone involved, it shows a love for Pitt’s campus,” Harper said.